I guess that's why it's called a tooth brush and not a teeth brush. A hearty Amen to that! Wait'll Veteran's Day and Memorial Day back there. My wife and I drove through the town of Clinton, MO on Memorial Day a few years ago while on vacation, and while driving by a nearby cemetery we had never seen so many American flags on display in our lives. Clinton's not that big of a town either! I do think in many ways the very best is yet to come for Curmudgeon! And I thank you in turn, Squid! It's a big part of what I love about the mid-west and the south -- those senses and observances of history, tradition and unapologetic (Mr. President, take a lesson) patriotism! I couldn't agree more. Three weeks from tomorrow we're outta here and four days later we're in God's Country! Last edited by ShadowCaver; 09-27-2009 at 08:27 AM.. It's getting to be a family tradition around my house. LJ, I take a look at that photo and then when I think of Berkeley I feel like I want to grab the nearest barf bag and hurl. Seems like two different universes. I'm a little over an hour north of Berkeley but it's not a whole lot better up here. O.B. might have some justifiable fears about how Ozarks living might change in the coming years, but I don't see it ever losing a single iota of respect or appreciation for those who wear or who have worn the uniform. 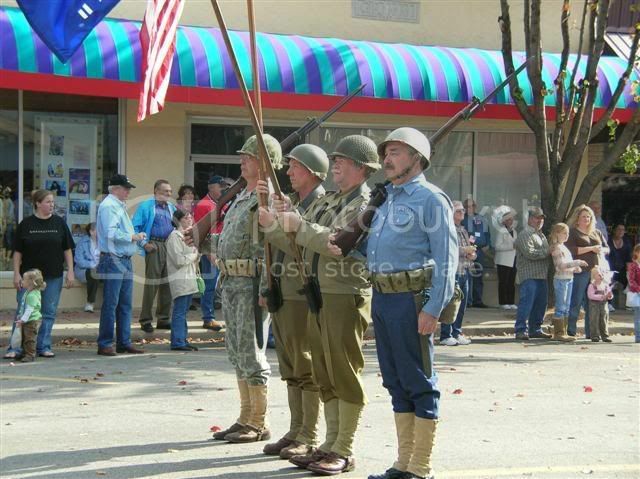 An entire Veteran's Week in Branson--that is absolutely fabulous! Whenever I feel down about how things are out here, I'll try to replace that with thinking about Curmudgeon's great fortune. Hopefully a honeymoon that won't end! And I'm counting my blessings too. Getting less in debt, I still have a very good job, and we'll either grind it out here and vacation back there whenever we can, or just go for broke and probably head for the Tulsa area (my career field makes it pretty necessary for me to live in or near a major metro area) and try to have a job lined up there beforehand. Just a few hours up I-44 to SW Missouri from there! We've got to make to one of your OTFCC (Over the Fence Coffee Club) gatherings before I get too old and gray, huh? Right with you on all counts, Eric. As for getting old and gray, not to worry. I'ver already achieved that status and it's not holding me back too much! Hey CM: Do you gotta be old to turn grey, or turn grey to be old? Welcome to the neighborhood, Curmudgeon!! Hey there NBeric!! It's been awhile! I know someday you'll make it for a OTFCC meeting, and we'll all be there! !